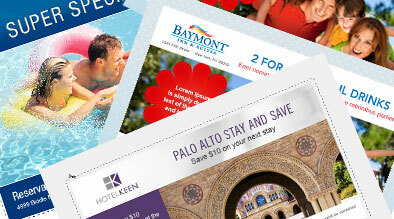 Create a coupon that is going to attract attention to the consumer. Anyone can give 10% discount on a room rate, so make sure your special stands out amongst the competition by creating a “Call to Action”. Create a coupon that is time sensitive. When you only have a special run for a limited amount of time – like a 24 hour deal – you are going to attract attention. Any time you put a time restraint on your coupon, you can telling the consumer to “Act Now”. Create a coupon around a holiday or an event in your area. You know more people are going to be searching for deals around these times, so make sure you create a great discount coupon for these special times during the year. Since there are many coupon sites out there, here are some of most popular coupon sites for hotels specifically and for sites that offer all types of coupons. It’s easy to set-up an account on any of these sites and once you do, you will be well on you way to attracting more business to your hotel and making your online presence more valuable to your consumer. In conclusion, it’s important to keep your business on top of new hospitality trends and coupons are the way of the future for online advertising – with low or little cost to the advertiser. With the surge in users looking for coupons these days there is no reason not to start promoting your website by creating online coupons!